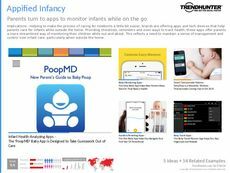 Find Better Ideas, Faster ® with a custom baby care trend report, our PRO Dashboard and 80+ categories of premium trend reports. 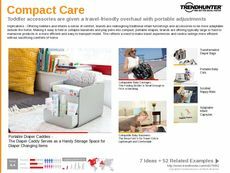 The Baby Care Trend Report is designed to expose the latest and most innovative products that cater to a newborn's health, wellness and comfort. 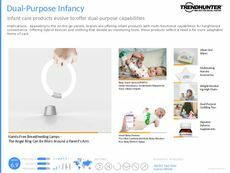 We will examine high-tech products such as baby monitors and sleep trackers along with the latest accessory offerings -- from educational toys to designer diaper bags. Lastly, this report takes an in-depth look at healthcare tools and nutritional products that ensure a baby is fed properly. This report is a relevant guide for pediatricians as it exposes the latest healthcare and wellness products that are designed to help parents care for a new child. It also benefits baby product developers who will investigate industry standards, existing products and the innovations of competitors. 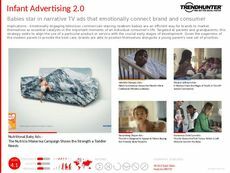 Trend Hunter's Baby Care Trend Report will prepare you to launch new products that will appeal to desired demographics. Its research will also ensure that you remain highly competitive within your industry.